Being a plus size bride is a nightmare in itself. Not counting the limited number of options you have clothes-wise, there is also a flurry of opinions from shopkeepers and stylists urging you to ‘settle’ for the options you have. One can argue that we can get clothes designed and stitched, but I am a fan of trying on clothes and the whole charade of playing dress-up. Here is a breakdown of the outfits I wore for the wedding hullabaloo! My maasi (mother’s sister) helped me find this very beautiful anarkali style floor length. It came in the red-pink colour and has a gold embroidered bodice. It also has a detailed and embellished neckline saving me the trouble of dressing it up with a necklace. I chose to wear this at a pre-wedding dinner with the family and accessorized it with these gorgeous earrings by Vastradi Jewels. This dress was picked up from a private designer boutique in Bangalore. For another pre-wedding function, Moong Bikhrai which marks the official beginning of all wedding preparations, I chose to go funky. I opted for this straight fit long orange kurta that I bought from CottonZone in Hyderabad. Since I believe in ‘Go big or go home’ when it comes to accessorizing, I decided to sport this pharoah inspired neck-piece I bought from BlissBox last year. It made my simple kurta pop and had me function ready in seconds. This 4 toned ombre saree with gota and thread work running along the border is my dream! I bought it from a store called Patrani in Bada Bazaar in Kolkata. 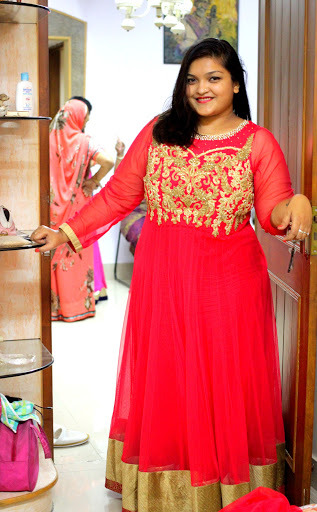 For my Sangeet function, I wanted a dress that was flowy and worthy of a princess. 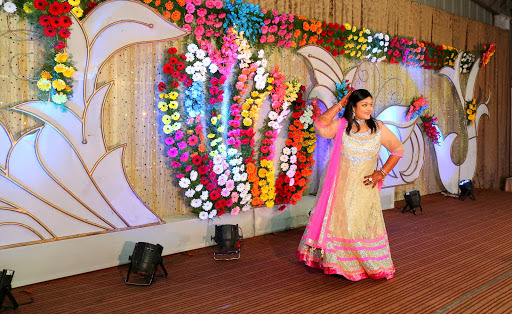 I did not want a lehenga because that would make dancing a real pain and who wants that! This floor length gold anarkali gown is all shimmer and all love. The pink in the dupatta and the dress pops like magic. I bought it from Mebaz in Hyderabad. This store is a haven for partywear gowns and anarkalis and offers the largest variety in terms of sizes and range. You can get the same dress here! 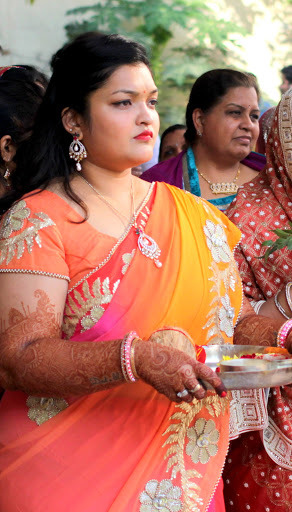 My Reception outfit is a raw silk lehenga in coral-orange-red colour family and it is beyond gorgeous. Bought this from Kolkata as well. But this outfit is so very special that I think I will have to do a separate post only for this! That is it for the clothes! Sometimes I wish I had a longer wedding only so that I got to doll-up for every occasion. 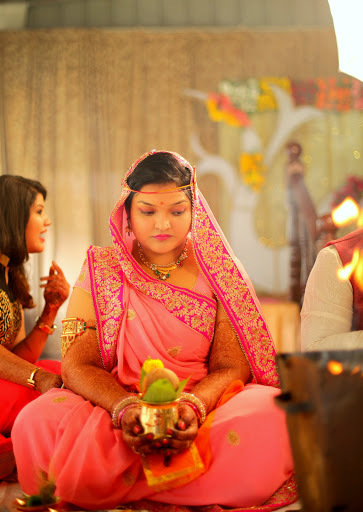 For the next of my posts in the #ShaadiSeries, do stay tuned! 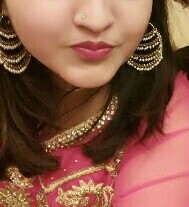 Next post#ShaadiSeries : I did my own make-up!